5th July 2015, this Italian cyber security firm has itself become the victim of a hacking attack. According to the documents, 400GB of which have been published, Hacking Team has also been working with numerous repressive governments – something it has previously explicitly denied doing. The company has repeatedly denied selling its technology to repressive regimes. But, if genuine, the leaked documents suggest that among Hacking Team’s clients are the governments and security services of Azerbaijan, Kazakhstan, Uzbekistan, Russia, Bahrain, Saudi Arabia and the UAE. Most notably, the documents include an invoice for €480,000, which purports to be from the Sudanese national intelligence service, dated June 2012. On Sunday night, an unnamed hacker, who claimed to be the same person who breached Hacking Team’s competitor FinFisher last year, hijacked its Twitter account and posted links to 400GB of internal data. With access to this data it is possible to link a certain backdoor to a specific customer. Hacking Team notified all its customers on Monday morning with a “blast email,” requesting them to shut down all deployments of its Remote Control System software, also known as Galileo, according to multiple sources. In recent years, Hacking Team sold its spyware—ostensibly to combat criminal activity—to various governments globally. The company has even presented to Swiss and Canadian authorities. One of the areas where Hacking Team has been roundly criticized is for selling to Sudan, a country with a notoriously poor human rights record. The African nation is also subject to a United Nations arms embargo, asset freeze, and travel ban. Hacking Team documentation accompanying the Flash exploit said it targeted “the most beautiful Flash bug for the last four years,” according to a blog post published Wednesday by researchers from antivirus provider Trend Micro. The use-after-free flaw resides in a Flash Bytearray object. Researchers at competing AV company Symantec have confirmed the existence of a Flash exploit that works against the latest version of Flash (18.0..194). The exploits can be used to surreptitiously install Hacking Team surveillance software, or other types of malware, on vulnerable computers with little or no indication anything is amiss. 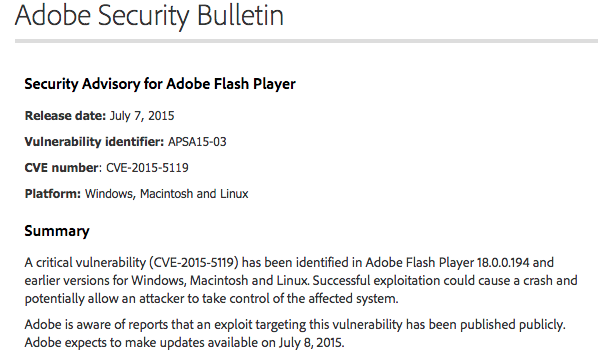 Adobe released a security bulletin about this vulnerability which is assigned CVE-2015-5119. A hacker using the online moniker “Phineas Fisher” has taken credit for the attack on Hacking Team. According to the document, the flaw affects Flash Player 9 and later on Internet Explorer, Chrome, Firefox and Safari. Trend Micro has analyzed the vulnerability and determined that it’s caused by a use-after-free (UAF) issue in the ByteArray class. Symantec has confirmed the existence of a new zero-day vulnerability in Adobe Flash Player which could allow attackers to remotely execute code on a targeted computer. Symantec regards this vulnerability as critical since it could allow attackers to remotely run code on an affected computer, effectively allowing them to take control of it. Hacking Team develops surveillance tools that it has maintained are legally sold to governments for law-abiding investigations. But critics contend the company’s software has been used to spy on dissidents, human rights activists and journalists. On Sunday, it appeared that Hacking Team’s Twitter feed was taken over. The banner on the page had been changed to “Hacked Team.” Several posts contained screenshots that are purportedly of the stolen data, which included emails sent by Hacking Team’s founder and CEO, Vincent Vincenzetti. In 2012, however, the FBI allegedly spent 310,000 Euros for Hacking Team’s services, all on licenses or upgrades, and the year before it spent 268,000 Euros. According to security researchers, an exploit for a zero-day vulnerability in Flash Player, created Hacking Team experts, appeared in the tool kits Neutrino and Angler. As per researches, Cyber attacks cost businesses around $400 billion every year.